Hair: Silver, straight and fairly short, kept back with a metal headpiece. Life history: Skywise is the closest thing the Wolfriders have to an astronomer. He is also the resident casanova, ready to join with any female who seems willing and able and taking life as lightly as possible. Skywise had a quite traumatic birth, as his mother Eyes High was captured by humans when she went into labour, shortly after her lifemate Shale was killed by those same humans. She kept back the birth for so long that, although she managed to send Skywise to safety, she died herself shortly afterwards, presumably from internal bleeding. The death of both his parents before he could even know them has made a great impact on Skywise and has left him with a deep-rooted hatred for humans, something not easy with a chief like Cutter. Skywise is 'brother in all but blood' to Cutter, something which started when Cutter was born, when Skywise saved him from a poisonous spider. Ever since then they have been inseparable, and Skywise was a great help when Cutter became chief at a very young age, being his advisor and friend. Skywise's most precious posession is his lodestone, which he acquired when he first entered the troll caves, when Father Tree Holt was burning down. The stone served as a footstool for king Greymung, who presented a chip of it to Skywise as a gift (with a bit of help from Cutter). It was this lodestone that led the Wolfriders through the desert to Sorrow's End by pointing in the right direction. Skywise spent the seven years in Sorrow's End 'feasting' upon the available beauties, but he left again when Cutter went on his quest to find other elves. Together they retraced their steps, had a short interlude with Picknose, Oddbit and Old Maggotty the trolls, after which they stumbled (Cutter quite literally) upon the two humans Nonna and Adar. This was the start of the extensive contact between the two elves and the two humans, much to the chagrin of Skywise, who had until then never found a reason to doubt his mistrust of humans. He had to admit, however, that these two were okay, although he still didn't like going to an entire village of humans with them. He was proven to be partially right when the thief attempted to steal his lodestone and Skywise almost plummeted to his death. Cutter tried to save him, but wouldn't have managed without the help of the human chief Olbar, who then sent them to the Forbidden Grove, which was on the way to Blue Mountain. In there they discovered the preservers, as well as Leetah and Cutter's cubs. They also found Nightfall and Redlance, who told them that the other Wolfriders were in Blue Mountain, having been captured by elves on giant hawks. Skywise went with the others to Blue Mountain, where they managed to get in and had their fist encounter with Winnowill. Skywise also had his first encounter with Aroree, which basically meant the start of a lovemating that would be on and off throughout their lives. 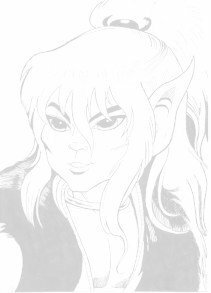 Just before the elf-troll war for the Palace, Skywise sired Yun with an unnamed Go-Back, though he didn't see her until far into the future. It was also in this war that the first cracks began to appear in Cutter and Skywise's relationship. While Skywise was fighting, wearing the metal armour Two-Edge had made, he discovered that it didn't make him invulnerable, and when he sent to his soul-mate in distress, Cutter broke the contact again as tenderly as possible because he was lock-sending with two other people at the time and couldn't divide his attention any further. Skywise understood, but felt resentful anyway. After the war was won, Skywise initially intended to stay in the Palace, because it had been so close to the stars, but caught up with the Wolfriders soon with the excuse that it didn't have any windows. He went with them to the Forbidden Grove, where they spent the next three years in peace. After these three years trouble came again, when Aroree came to the Forbidden Grove. Skywise, who wanted to know why she had abandoned them three years before, took her into the holt, where she saw Windkin and snatched him, after which Dewshine grabbed her hawk and went along to Blue Mountain. All this happened the night after Cutter had left to go to the Hoan G'tay Sho to try and make a start in breaking Winnowill's power. Skywise went straight after him to update Cutter on the situation and think up a plan. After many things didn't really work out as they had wished, Skywise went with several Wolfriders to the aid of Cutter, but got caught in a stone cavity in Blue Mountain when it started to change shape and turn into two more layers of the large egg. He almost died there, but Cutter managed to get him out just in time. This experience did make Skywise claustrophobic, but Cutter helped him over this again. Skywise was part of the group chosen to go with the Palace across the Vastdeep Water to investigate the cry for help that Suntop had heard, and it was to him that Timmain wolf-sent her message to 'seek one voice among the many', which eventually made Rayek find out that it was the High Ones who had sent the cry. Skywise was in the Palace when Rayek flew it into the future, as one of the people of whom Cutter thought they might have some influence on Rayek, so he was separated from his soul's brother and didn't know better or he was dead. Unable and/or unwilling to accept this, Skywise begged Leetah to change his blood so that he would become immortal; he wanted every chance he had to go back to Cutter and the other Wolfriders. This decision has had great impact on Skywise's life. Not only did the loss of his wolf-blood make him lose his sharp wolf-senses, he also felt alienated from the other Wolfriders, even more so because Ember was now the only Wolfrider younger than him; all the others, including Cutter, were at least five hundred years old when the Palace returned, compared to Skywise's rather meagre forty-odd, and Skywise felt like he was treated as a cub by all the others. It didn't improve matters when Cutter sent him along with Ember when he split the tribe in preparation for the war with Grohmul Djun. Cutter did this so Skywise could be to Ember what he had been to Cutter, a friend and advisor, but Skywise didn't understand and felt even more alienated from Cutter. Halfway through the Shards war he received word from Aroree (from afar) that Timmain was needed to put the Palace back together. Skywise agonised over either staying with Ember, who needed his advice, or going with Timmain to the Citadel. In the end he did the last, and he was there when Timmain reassembled the Palace. Since that time she and Skywise reside in the Palace, occasionally taking it on a trip to the stars.